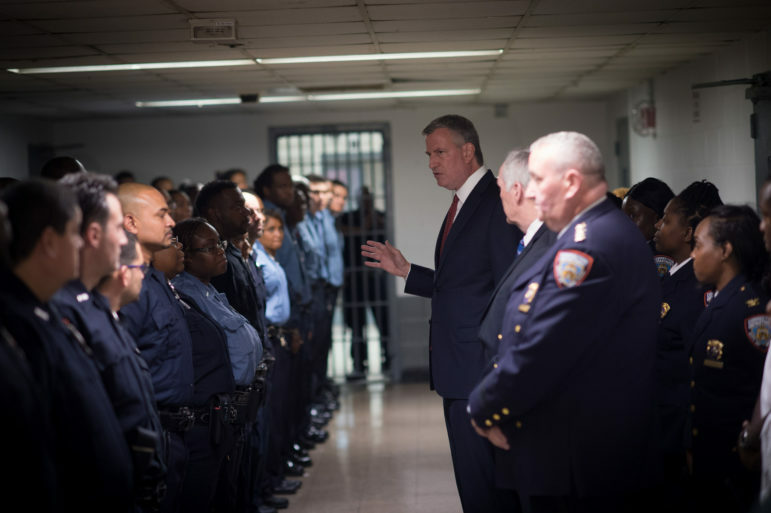 Mayor de Blasio during a 2016 visit to Rikers Island. Just a year later, he promised to close Rikers in 10 years, calling this a “very serious, sober, forever decision.” Was De Blasio supporting the move to close Rikers because he truly believes in criminal justice reform, or just to get reelected? If the mayor is serious about closing Rikers in a decade—and even more so if officials calling for a three-year closure timeline mean what they say—then work towards that goal starts right now. The mayor’s spokesperson agrees that Rikers should be closed as soon as possible, but note they need to bring down the population first. But it’s even more complicated than that. Shutting down Rikers without putting critical services and structures in place first will lead to critics of criminal justice reform saying “I told you so” – and more suffering by those caught in the mass incarceration crisis. 5) Improvement of conditions of confinement, risk assessment, reducing inmate-to-staff ratio, providing phone/internet services to inmates, and more. Furthermore, Rikers itself needs to be repaired now. Correction officers’ and inmates’ lives are at stake. As a correction officer and captain for 29 years on Rikers, I saw how dangerous it is for officers and how dreadful conditions are for inmates: I know we must close it as soon as possible. Now an assistant professor at SUNY in criminal justice and forensic psychology, I have long worked to achieve this goal. My first years with the NYC DOC were at the now-closed Bronx House of Detention for Men (BHDM), so I know the difference between a well-functioning, community detention facility and the sprawling, out-of-control mess at Rikers. Located near the courthouse and multiple transit lines, BHDM made it easy for inmates to have visits from family, friends, and attorneys, and get to court hearings without having to wake up at three in the morning for rush-hour bus transit off the single bridge from Rikers. Nearby hospitals ensured easy access to medical and mental health appointments or emergency treatment, resulting in fewer illnesses or deaths. Prisoner advocates and civil rights groups could monitor treatment of prisoners without obstruction. The central location allowed correction officers and staff to get to work easily, and nearby banks, restaurants and stores made their day-to-day lives more convenient, reducing their stress and thus improving interactions with inmates. Grateful for the superior working conditions at BHDM, and to prevent transfer to Rikers, officers and staff followed the rules and had lower rates of absenteeism and turnover. Life at BHDM was not a picnic. It was jail, and it was hard – but everyone knew they were lucky to be there as opposed to the remote, dirty, aging, overpopulated and underserved jails on Rikers. I want to state this clearly: It is a small minority of correction officers, administrators, and staff who participate in violent incidents against inmates, or in covering up these attacks. Likewise, the inmates who are involved in fights and beatings are a small fraction of the inmate population. Most correctional staff members at every level and rank, and even the bulk of the inmates, are not involved in violence behind bars. Nevertheless, due to the severe injuries, misuse of power, and potential for deadly force against inmates, officers, and staff, this issue must be addressed directly, promptly, and with serious attention. Back then, with the best of intentions, state mental hospitals – called “snake pits” then, just as Rikers is called today – released their patients with the goal of providing mental-health services in the community, via supportive housing and local clinics. But needed services were not in put place first, and society suffered as the homeless mentally ill lived on the streets, often getting picked up by cops and serving time on Rikers, since they couldn’t afford bail, didn’t have legal representation, and faced a short sentence. Today, we don’t want to move these populations from Rikers to another form of supervision and control and end up with the same number under surveillance at even higher cost – and perhaps even more, as the reach of these alternative programs extend beyond those who would have been locked up at Rikers originally. Question 1: How do you plan to reduce/prevent violence from being imported by the same violent inmates and correction officers into the smaller jails in each borough after Rikers is closed? When moving the same violent and combative inmates with substance abuse problems, mental stability issues, gang affiliations and past confrontations – and the same officers who have a track record of using excessive force and not following policies and directives regarding inmate care – into a new setting, how do you prevent them from importing the same negative behaviors they have resorted to in the past? Two critical elements must be addressed: the “culture of deviance” by correction and police officials, where corruption and rule-breaking occurs at the highest level; and the “culture of violence” perpetrated on the front lines by correction officers, staff and supervisors, who feel that “everyone does it” since those at the top get away with disregarding regulations. Dozens of DOC administrators, supervisors and officers have been charged with multiple infractions: taking official cars for personal trips, smuggling contraband into jails, using excessive force, filing false reports, even intimidating witnesses and victims. If those at the top break the rules with impunity, why should front-line staff and inmates follow them? There must be investigations and serious consequences for rule-breaking. There is little confidence in the criminal justice system if administrators are immune from prosecution for offenses that result in incarceration for those inside the jails they are managing, and little reason for rank-and-file officers, dealing with difficult situations on a daily basis, to follow rules if their own superiors don’t do so. This problem must be addressed from the top down to prevent continued misbehavior by officers in the new smaller jails. Despite lawsuits and oversight by a federal monitor at Rikers, excessive force and cover-ups continue. Inmates are punched in the head, slammed into walls, dragged and kicked while handcuffed, and attacked with pepper spray – even though de-escalation techniques would better defuse conflict. Since 2014, 38 officers and staff have been arrested as a result of DOI investigations. With many incidents going unreported, this number of arrests and indictments shows the situation at Rikers is out of control. The atmosphere of violence has led to an increased number of inmate fights. Meanwhile, a lack of substance-abuse treatment or positive programming means there is nothing for an inmate to lose if they engage in violent acts, so there are no consequences for such behavior other than excessive stays in solitary, which are no longer permitted due to the federal consent decree. This behavior will continue and be imported into the small neighborhood jails unless it is addressed at the policy level. Disciplinary methods must be put in place other than solitary confinement. Evidence-based research has shown that inmates with engaging educational and work programming are afraid to lose these benefits, and the threat of removal from those desired classes and jobs is an effective deterrent to such infractions. Finally, improved inmate programming and staff training is required. Since the number of detainees will be reduced by moving non-violent, first-time offenders, petty criminals, and those who cannot afford bail, to new community justice programs and alternatives to incarceration, the new jails will house only the most violent and dangerous offenders with long criminal histories and high likelihood to be a danger to the community. This volatile population will need intense, multi-faceted service programs run by experienced counselors and specially trained correction officers to keep inmates engaged and out of trouble. Updated hiring and education practices are needed to prevent the same violent and deviant officers – mixing now with only the most violent inmates, repeat offenders and hardened criminals –from leading to the same level of violence being imported into in the new locations. Question 2: What is the city’s responsibility to citizens who would have been incarcerated for a short-term but are now released to the community as a result of decarceration? What will the city do with the people diverted from incarceration via youth court, drug court, mental health court and other alternative channels? Will there be services or supervision provided for these vulnerable populations, now left in their low-income community and likely to re-offend or miss their court dates? What support can the city provide for these individuals via alternatives to incarceration? they might have been referred to appropriate social services upon release, what support will the city provide to prevent them from re-offending or going farther down the path that brought them into custody in the first place? These are often young people, first-time offenders, those with substance abuse problems, mental health issues, involved in “quality of life” crimes often caused by financial instability like vagrancy, loitering, public drunkenness or petty larceny (such as jumping a turnstile). If the current presidential administration cuts anti-poverty efforts to the bone, and New York City stops locking up low level offenders who return to their now even more underserved communities, are we creating a debacle? A range of support is needed for those released into the community so they don’t fall back into criminal behavior, including Social Services: Case management & intensive case management; habilitation & rehabilitation (vocational/job training; emloyment programs; academic/interpersonal skills training; leadership, mentoring, and youth development); and health and wellness support (health, wellness and stress reduction; mental-health and pharmacological treatment, including substance abuse treatment). Mental healthcare is particularly important, since if the mentally ill are not treated in the community, they end up involved with law enforcement, and indeed currently make up the majority of those incarcerated in our jails and prisons, where they receive even less treatment than they did in the past at the “snake pit” mental hospitals. Fact-based studies show the best way to reduce crime is to address these issues with smart, multifaceted programming. Question 3: What will you do right now (not three or 10 years from now) to reduce or eliminate acts of violence against correctional staff and inmates currently on Rikers Island? The violence and corruption on Rikers – extreme neglect, gang fights, attacks on correction officers, contraband smuggling, sexual abuse, and more – must be stopped right now, during the transition process. The level of damage to people on Rikers, even for a short time, has been demonstrated time and time again, with both inmates and correctional staff vulnerable to mental illness and suicide caused by exposure to the toxic environment on Rikers. While closing Rikers as fast as possible is the goal, the city needs programs in place and fully operational before this occurs. Simultaneously, the city must address violence on Rikers right now, both to reduce the suffering of the inmates and officers there presently, and to prevent the violence from being imported into the new jails. It should be noted once again, that despite the disturbing reports of violence and mismanagement cited throughout this article, good staff and even good inmates actually exist. It’s a small percentage of correctional officers and administrators, and a small percentage of inmates, that account for the majority of violence on Rikers Island. Nonetheless, it is critical to improve circumstances to prevent the violence from recurring in the new locations. Moving from an era of mass incarceration to an era of decarceration requires programming not just for those who would have been incarcerated, but to all in the community, so as to prevent criminal justice involvement. A public information program is also needed to change views about incarceration and rehabilitation in the community, reducing the lifelong stigma of contact with the criminal justice system. Yes, I believe that Rikers must be closed, completely closed, with no inmates there whatsoever – but this cannot happen without having proven programs and alternate sites open and fully first. It appears that the issues plaguing Rikers are being used as political pawns by those at the highest levels of city government. Rikers should be closed, but that is impossible in three or even 10 years without a concrete plan in place to identify and prepare sites in the five boroughs where the new smaller jails will be located, hiring architects and urban planners and developing alternatives to incarceration and improved programming as described. As of this writing, I have seen no evidence that any of this is underway. David A. Fullard, Ph.D., is a Visiting Assistant Professor at Empire State College, teaching Criminal Justice and the Social and Behavioral Sciences. He is also licensed by the State of New York Board of Regents as a Mental Health Counselor (LMHC). He retired in 2011 as a captain with the New York City Department of Correction (NYCDOC) after 30 years’ service. Reform Rikers but don’t close it. It’s isolated island location makes it the perfect location for a jail. Escapes nearly impossible from there. Too damn bad if inmates families have long trip to Rikers. Don’t commit a crime and you won’t end up in Rikers. Very simple. According to IBO, 78 percent of the people detained on Rikers Island are detainees, not inmates — they are awaiting trial and presumed innocent. Nearly three-quarters (72 percent) of those pre-trial detainees had bail set, meaning they were on the island only because they couldn’t afford the bail. Some would call your remarks about inmate families callous and counterproductive–the latter because maintaining connection to family is a key ingredient in successful reentry after incarceration, which means less likelihood they will offend again–but they’re somewhat beside the point because they don’t apply to the vast majority of people on the island. The author’s reasoning is circular. Of course, reforms need to be carried out, but even he admits this can and must be done at Rikers. Yes, new neighborhood jails would be more convenient for inmates’ families, but there are costs to building them, too. Does the author propose that we condemn entire square blocks in downtown Brooklyn and Manhattan to build new jails? As he points out, bad behaviors would certainly be imported into those new facilities, unless the reforms were first made at Rikers — but in that case, there would be no need to close Rikers. The isolation on Rikers affects more than just inmates families, it means that a corrections officer has a 2-3 hour commute each way, meaning officers often sleep in their cars rather than going home at night. It means that inmates with court dates have a 4+ hour round trip to court, meaning that for morning arraignments they’re woken up pre-dawn without being given any food until they return sometimes 8 hours later – sometimes more if they need to consult with their council after a hearing. Their lack of food and sleep can have a serious impact on their performance in court. The cost of transporting inmates to and from court is astronomical – removing that alone would pay for the new facilities. Rikers’ isolation also means that contractors working on the island can’t deliver materials or workers efficiently and construction costs on the island are 40% higher than elsewhere in New York. The buildings themselves are not only dangerous in that they’re falling apart and inmates are literally tearing building materials off of the walls and ceilings to use as weapons – but also in their layout – cell blocks in Rikers were designed with blind corners, meaning that corrections officers can’t see dangerous and violent situations in their cell blocks. The primary focus of this study would be to maximize the potential of sites that the DOC already owns – sites that either are or have previously been jails. For more information read the Lippman Commission report – http://www.morejustnyc.org – not only does it explain the logic behind closing Rikers it proposes alternative uses for the island that would generate considerable income for the City. While there’s a lot of discussion about where new jails might go, the heavier lift might be figuring out how to release enough violent-felony defendants to allow the city to move detainees off the island. A writer currently incarcerated on the island writes that re-establishing similarly flawed facilities elsewhere will displace the problems on Rikers, but won’t dispense with them.